This month’s HEB Ciao Italia Primo Picks feature the best in HEB’s Italian food line-up: decadent alfredo sauce, Italian-made pastas, balsamic vinegar, Blood Orange Soda (the second most-important ingredient in sangria) olive oils, and baiocchi cookies that, no matter how high in the pantry you try to hide the bag, still reel you in with their sweet chocolate-hazelnut filled siren song. Just as I do each time a box full of magical deliciousness arrives on my doorstep, I have the challenge of taking a handful of ingredients and transforming them into – for real, I swear. This is the last cookie. Where were we? Yes, lasagna rolls. Chicken alfredo lasagna rolls. 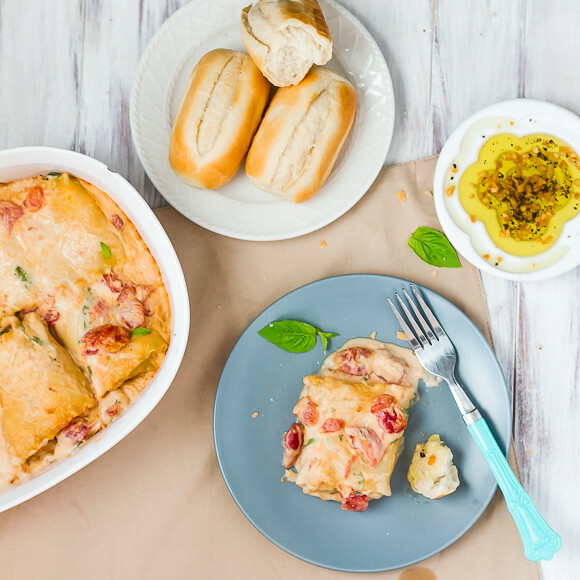 I picked up an “Italian Herb” rotisserie chicken and a handful of ingredients and then set out to create a rich, decadent white lasagna roll. 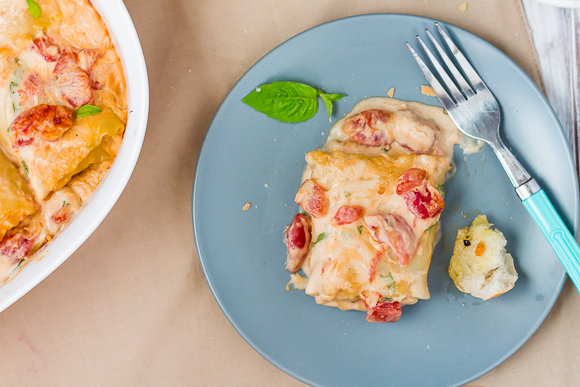 The inside of the lasagna roll is filled with a mixture of ricotta, parmesan, spinach, tomatoes, and chicken. 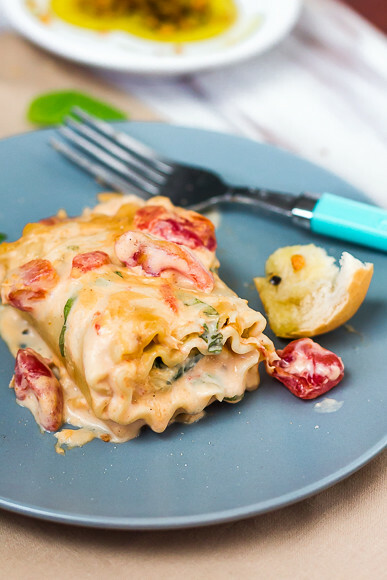 The top of the lasagna is smothered in an alfredo sauce studded with tomatoes and fresh basil to help cut the richness just a bit and provide some fresh color. 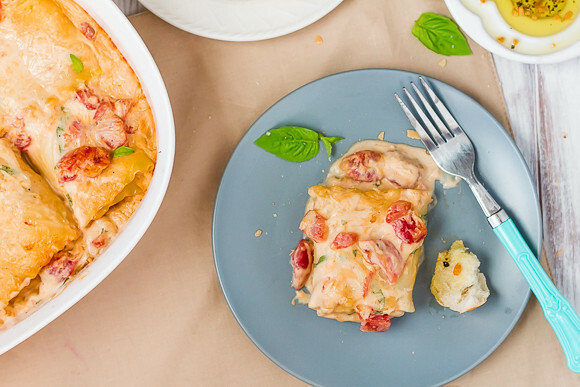 Out of the oven, those ingredients transform into bubbly, cheesy, and hearty chicken lasagna rolls. Betcha can’t eat just 3. And don’t forget to pop over and enter the Ciao Italia sweepstakes to try your hand at a handful of goodies from HEB: a trip to Italy, a car, a scooter, and a handful of HEB gift cards are just a few of the amazing prizes. Buona Fortuna! 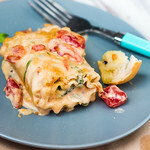 Tomatoes, basil, chicken and alfredo sauce fill these decadent and creamy white lasagna rolls. Grease a large casserole dish or 13x9 (you'll have a little space leftover) with olive oil or cooking spray. Also grease a large baking sheet or lay out a large length of wax paper to spread out the cooked noodles so they don't stick together. Empty the can of diced tomatoes into a strainer set in the sink - drain very well. Bring a pot of salted water to boil and cook the noodles according to package directions. While the water is coming to a boil and the noodles are cooking, prep the veggies and shred the chicken. Heat 1 Tbsp olive oil in a separate pan and add the shallot and baby spinach. Cook, stirring frequently, until the spinach has nicely wilted and then add the garlic. Cook 1 minute more and then turn off the heat. In a small bowl, mix together the egg, ricotta, 1/4 cup of Parmesan, salt, pepper, and a dash of nutmeg. Add the shredded chicken and 1/2 cup of the diced tomatoes to the spinach mixture and then add the ricotta mixture, stirring until well mixed. Drain the noodles and return the empty pot to the cooktop (heat off). Stir together the alfredo sauce, milk, remaining tomatoes, and chopped basil. Spread 1/2 cup of sauce mixture into the bottom of the casserole dish. Spread the noodles out on lightly oiled surface (wax paper or a large baking sheet). Dollop 1/4 cup of ricotta mixture over the noodle, leaving the last 2-3 inches on one end naked. Roll the lasagna noodle and transfer to the casserole dish. Repeat until all noodles and filling are used. Top the rolls with the alfredo sauce and remaining Parmesan and bake for 30 minutes, until bubbly. Let sit ~10 minutes before serving. This recipe was developed in conjunction with H-E-B and I was provided ingredients as well as compensated for my time. Messy fingers, stretchy-waisted pants, and marinara-stained new white shirts are all mine. You can find H-E-B on Facebook, Twitter, and Pinterest. And if you’re as lucky as we are, 3 locations within a 5 mile radius. Made this yesterday and it was fantastic. I did make a few adjustments. I doubled the tomatoes and made it a traditional style pan lasagna instead of the rolls, covered with mozz and parm and baked. Thanks for the recipe, it’s a keeper.